Homemade crispy calamari is quick, easy and definitely worth the effort. Dip into creamy garlicky mayonnaise. For the mayonnaise, mix all the ingredients together and set aside. 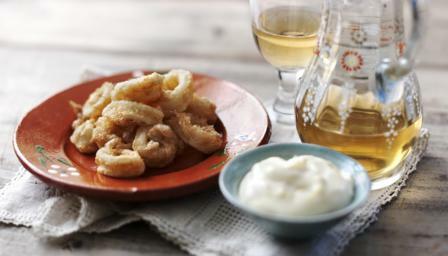 For the calamari, place enough oil in a wok, large saucepan or deep-fat fryer to come halfway up the pan. Place over a medium heat. If you're using a deep-fat fryer or have a thermometer, heat the oil to 180C/350F. If not, to check the oil is at the right temperature, drop a 2-3cm/¾-1¼in cube of bread into the hot oil. It should become golden and crispy in 1 minute. While the oil is heating, place the flour, cayenne, paprika and salt in a large sandwich bag. Drop in the squid and shake around to coat evenly. This may need to be done in two batches, depending on the size of the bag. Dip the floured squid into the beaten egg and then carefully drop into the hot oil. Fry for 2-3 minutes until golden. Remove from the oil and briefly drain on kitchen paper before serving with the garlic and lemon mayonnaise.